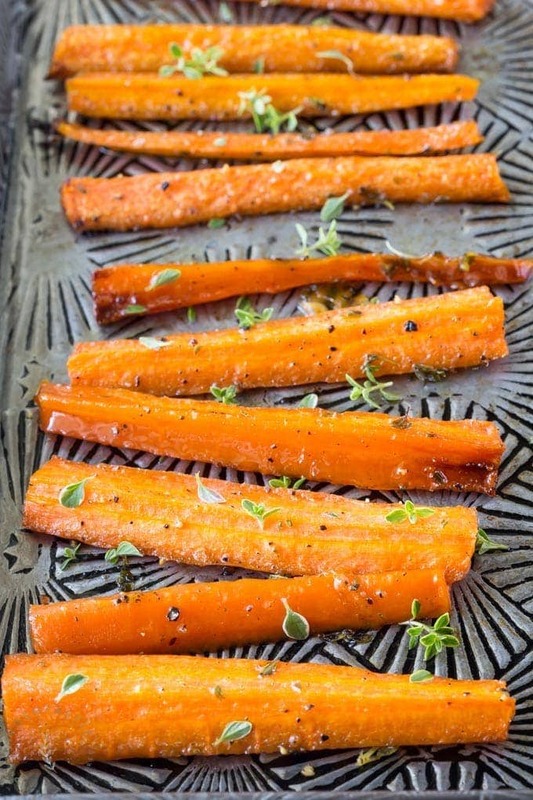 Quick and easy Paleo glazed carrots made with honey, olive oil and fresh thyme. 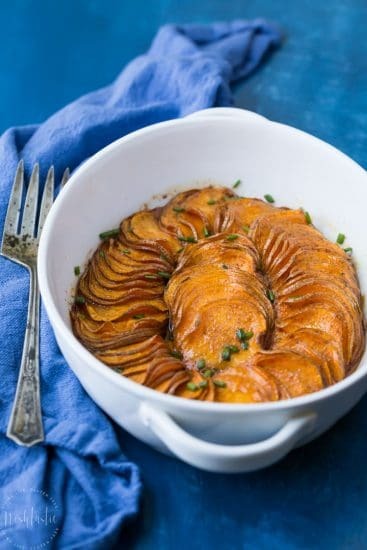 You can cook them on the stovetop or bake them in the oven! I know that when I’m preparing a big dinner for my family oven space is at a premium, so for that reason I’ve provided both stove top and oven roasting methods for cooking for my Paleo Glazed Carrots. The full printable recipe is at the end of this post. Step 1 – Cut the baby carrots into halves, crosswise on a sharp diagonal. This is really just to make them look pretty, you can leave them whole if you want but they may take just a little longer to steam. Step 2 – Bring slightly salted water to a boil in a large pot with a steamer basket. Let carrots steam until they are just cooked which will be about 8 minutes. 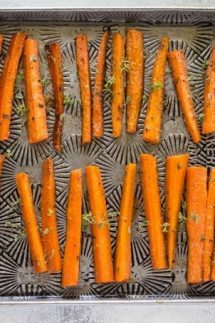 Step 3 – Drain the carrots, remove the steamer basket from the pan and place cooked carrots back into the pan then toss with the oil, honey, salt, pepper, and fresh thyme. Step 4– Sauté for about 5 minutes on a medium high heat, then serve hot. 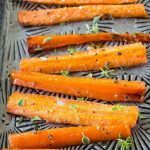 I love to roast Paleo Glazed Carrots in the oven, I think they get that lovely caramelization that can be harder to achieve on the stove top, so if you have room to bake them in your oven give this method a try! Step 2 – Steam the carrots as directed above, drain, and then toss with the oil, honey, salt, pepper as before. 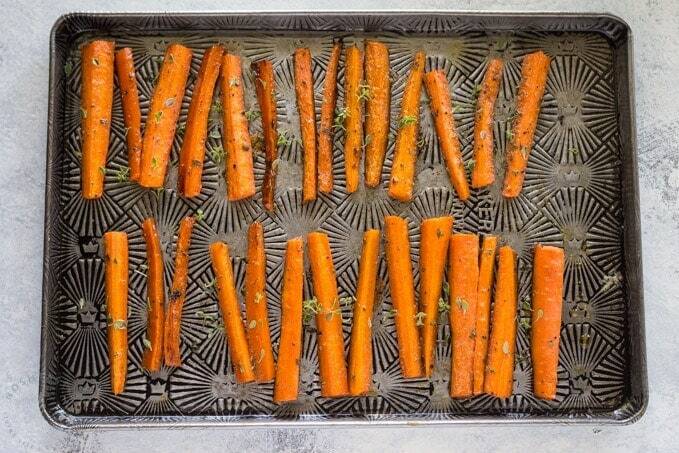 Step 3 – Place the carrots in one even layer on a parchment lined baking sheet (not waxed paper or foil, they will stick!) and bake for 20-25 minutes. Sprinkle over the fresh thyme leaves in the last 5-10 minutes of cooking. Like this? 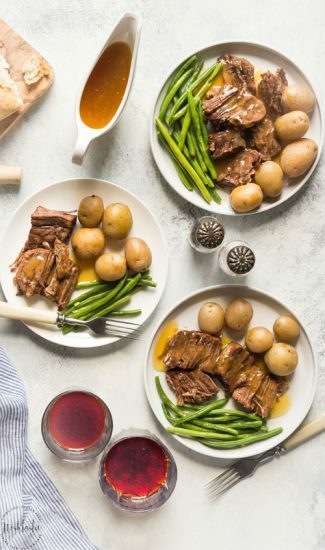 You’ll LOVE these Paleo Recipes! 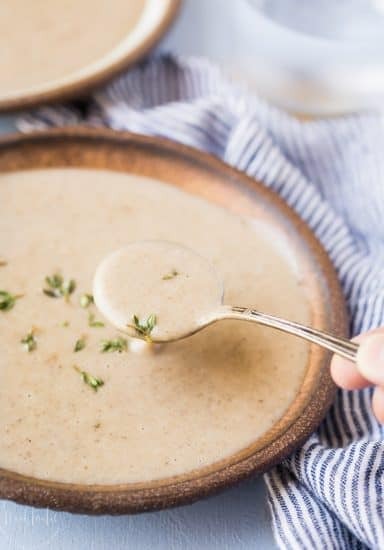 This is the best easy recipe for Paleo Cream of Mushroom Soup you’ll try, you can make it in less than 30 minutes and it’s Whole30 too!